Posted by Destin Real Estate Sales on Thursday, August 27th, 2015 at 8:24am. Here at Ocean Reef Real Estate we receive many inquiries about fractional ownership opportunities located at the Emerald Grande in Destin and Inspiration at Sandestin. This is a relatively new kind of real estate that was introduced to the Emerald Coast in recent years and many may not be familiar with type of purchase. Here are some key notes that will help you decided if Fractional Ownership in Destin is right for you. Fractional Ownership allows parties who are usually unrelated to have a partial ownership and mitigated responsibility in a high-value tangible asset, which is most often resort real estate property. Fractional ownership endeavors include management administration, maintenance fees and certain rules documented in purchase agreements. A management entity oversees daily operations and each fractional owner is guaranteed a prescribed amount of access usually on an ongoing revolving basis which changes with each year. Often properties can be rented out for income. If the management group rents it out proceeds are split on a pre-agreed amount between the management group and the owner. The main advantage to fractional ownership is that it allows one to purchase a portion of a high end valuable piece of property that may be beyond their current budget. It may also be advantageous for those who do not wish to pay a large amount of money for 100% ownership in real estate vacation property that’s not often used themselves and do not want the responsibility or desire to have it year round. Both the Emerald Grande in Destin and Inspiration at Sandestin in Miramar Beach have fractional ownership properties available. 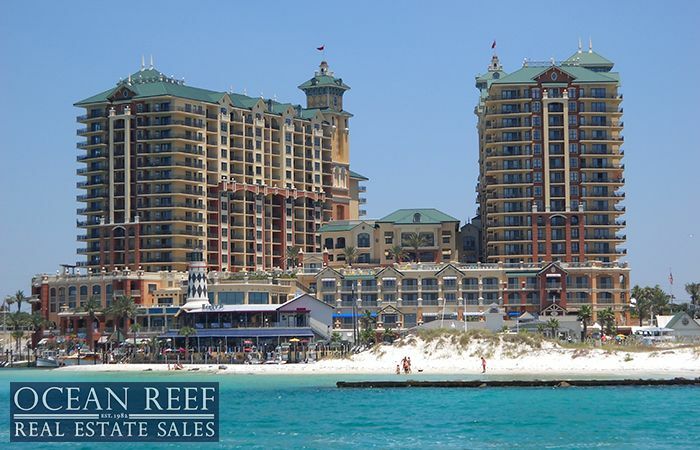 The Emerald Grande is a high rise luxury condominium tower complex with a coveted location that soars eighteen stories above bustling Harborwalk Village on the Destin Marina. It has luxurious amenities including a giant swimming pool with hot tubs on their Grand Vista level overlooking the harbor with panoramic views across the glistening gulf, East Pass and the Choctawhatchee Bay. The complex includes an indoor pool and a full state of the arts fitness center spa. Fractional owners purchase the use of their property for 1/8th of every year which is approximately six consecutive weeks. Access time advances forward each year so that each owner eventually is able to use their property during different seasons over an extended multi-year period. Current fractional offerings at Emerald Grande range from $11,900 for a one bedroom 600 square foot unit to $250,500 for a three bedroom 1,675 square foot unit with an average at $115,645 for a three bedroom with approximately 1,400 square feet. Inspiration is a waterfront enclave of exclusive single family homes in the 2,400 acre gated community of Sandestin with four championship golf courses and the resort extends from the bay to the glorious gulf. It is located near the charming Disneyesque French Quarter inspired Village of Baytowne Wharf which offers fine restaurants, lively bars, specialty shops, seasonal festivals, family amusements and free musical concerts. Inspiration fractional owners receive four week of use each year. The price range for the few fractional ownership properties available at Inspiration range from $26,500 to $29,500 for a three bedroom single family residence with 2,278 square feet. If you have interest in fractional ownership in Destin feel free to contact one of our Ocean Reef agents at 877.392.6085. We will be more than happy to provide more information about these properties today. 10 Responses to "Fractional Ownership in Destin"
Sandra frantz wrote: I'd like more information about this please. Posted on Thursday, August 27th, 2015 at 1:36pm. Craig Vernon wrote: I'm interested in fractional ownership. Please tell me more. Thanks Posted on Thursday, August 27th, 2015 at 2:50pm. Destin Real Estate Sales wrote: More information coming your way! Posted on Friday, August 28th, 2015 at 10:04am. ted mullins wrote: please send me more info on fractional ownership Posted on Friday, August 28th, 2015 at 11:10am. Melany auricchio wrote: I'd like more info on fractional buying for the Destin -Sandestin area please Posted on Sunday, September 6th, 2015 at 11:45am. Intervals? Posted on Friday, September 30th, 2016 at 8:40am. Michelle wrote: More information on Inspiration please Posted on Friday, March 10th, 2017 at 10:28am. sam mannino wrote: basically i know nothing about fractional ownership. sounds interesting if weeks are at right time. please send as much info as possible. Posted on Thursday, May 25th, 2017 at 8:26am. Ernest wrote: Please send me additional information on fractional ownership. Posted on Monday, July 10th, 2017 at 10:54am. William wrote: I'm interested in fractional ownership at your Inspiration location. Posted on Sunday, March 4th, 2018 at 8:20am.